Over a period of centuries the Ancient Ones of the American Southwest constructed a pattern of sandstone villages that precisely matches key constellations in the sky. This book plunges you into the mysteries of these unified star correlations. Other fascinating topics include: Orion’s global stargate shrines, Arizona earth chakras, crypto-creatures and star ancestors; the lost empire of Aztlán; evidence of transoceanic migrations to the Southwest in early epochs; the purpose of massive pyramids and canals made by those who once lived on the site of modern-day Phoenix; the subterranean origin of the Anasazi; the cave conundrum of Grand Canyon; the Hopi Mystery Egg; and prophecies of the Fifth World. Chapters include: Stellar Arizona; OZ (Orion Zone) Rising; Arizona Earth Chakras; Grand Canyon Cave Enigma and the Hopi Underworld; Pyramids and Canals of the Phoenix Basin Hohokam; The Hopi Mystery Egg and Prophecies of the Fifth World; All Roads Lead to… Chaco; Pole Star to the Underworld—Anasazi Ruins of Northwestern New Mexico; Mimbres—A Pre-Columbian Counter Culture In Southwestern New Mexico; Mummies, a Meteorite, and the Macaw Constellation—Casas Grandes, Mexico; The Lost Empire of Aztlán; The ABC of Orion: Ants, Bulls, and Copper; pic Seas Voyages of the Desert People; Genetic Evidence For Pre-Columbian Travel To the American Southwest; Global Orion Shrines—A Celestial Plan; more. 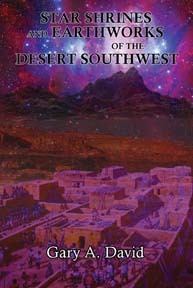 STAR SHRINES AND EARTHWORKS OF THE DESERT SOUTHWEST By Gary A. David. 384 Pages. 6x9 Paperback. Illustrated.